This chapter provides a very nice outline and summary of options in treating the patient who has experienced no recovery or only partial recovery after a brachial plexus injury. These options are broken down into those that help hand function, elbow function, and shoulder function. Common reoperative procedures to improve the function of a patient with a brachial plexus injury that has not healed from the initial procedures include tendon transfers, joint fusions, and, in some circumstances, sensory nerve transfers in order to maximize the patient’s ability to gain some function with the extremity. In extreme cases, where a patient is having severe chronic pain, as well as in some other unique situations, the option of amputation can be entertained. Expertise in brachial plexus surgery is difficult for the individual hand surgeon to gain unless he or she is at a major referral center. 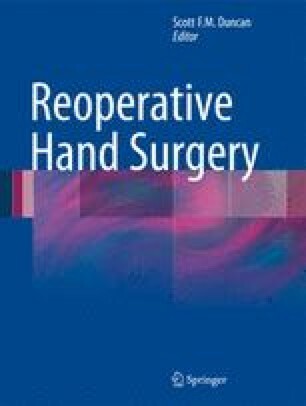 However, fusions and tendon transfers may be within the typical hand and upper extremity surgeon’s repertoire. This chapter outlines these reconstructive options for this difficult and ­challenging clinical situation.